Sympathyplaques.com is primarily a supplier of Memorial Stones, Plaques, Benches, and Angels. All wholesale purchases must be made by a licensed retailer. Retailers will be required to provide a tax identification number before shipment of an order. delivered by Roadrunner's delivery van. Orders may be placed by calling Adam at 217-825-8653 or you may fax your order to 217-562-5792. After submission of your order we will contact you by phone to confirm your order and request credit card information for payment. Customers within our Van Delivery areas my receive orders delivered by Roadrunner's Delivery Van. The order will be brought directly to your store. Other orders are shipped on a pallet using a common carrier which will deliver by semi truck. 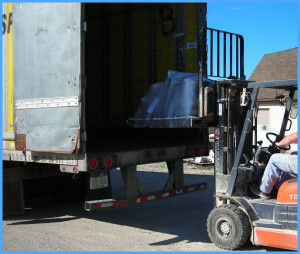 The products are light enough that they can be unloaded by hand if you do not have a fork lift or a dock available. Our heaviest item is a bench top which weighs about 45 pounds. If a lift gate is required, it must be requested when the order is placed. An additional fee will be charged for the lift gate, appointment, other special delivery services. Common carriers may assess a fee for unloading times longer than half an hour. Upon shipment you may request a phone number for the carrier or a PRO# for your shipment if you wish to track it. When your order arrives, be sure to inspect the exterior packaging. If the packaging appears to be damaged in any way, DO NOT SIGN for it. Instead, write DAMAGED in the signature block. Unpack your order as soon as possible and notify us of any damage. All other locations call 217-562-3505.